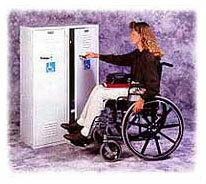 Ennho Lockers provide convenient access for physically challenged students, teachers, or visitors. Low profile design. Easy to reach, grip-and-turn handles require less than 20° rotation to pop doors open then return to the lock position automatically. 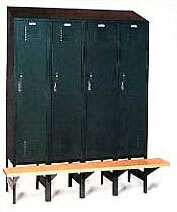 A. Duplex Standard Lockers conserve floor space by providing two individual lockers in each frame. Each compartment is 7 1/2" wide, doors are hinged in center. Each compartment has a hat shelf and single prong coat hooks. B. Two Person Quiet Lockers are only 15" wide, with two full length coat compartments and two separate compartments on top. Doors are hinged in the center allowing simultaneous access for both users. Deluxe Club Locker can include such amenities as door trays, mirror and towel bar in addition to large, roomy interiors for apparel, footwear, equipment, and personal belongings. Lockable inside compartment and double-hung doors include padlock attachments, may also be fitted with built in key locks or combination locks and number plates. Sizes overall: 24"w x 21"d x 60"h or 72"h, without legs. Add 6" to height for legs when desired. Food Industry Standard Lockers feature 16" high legs (with provisions for bench attachment) to make mopping or hosing floors easier when required. Sloping top option speeds cleaning, deters accumulated debris. Ennho strongly recommends wall and/or floor anchoring for all locker installations.